M.I.A. to play concert at The Fox in Oakland, CA — can a national tour be coming soon? Whoa, M.I.A. has been confirmed to play a concert at The Fox Theater in Oakland, California on November 2, 2017. Not sure how long this has been known, but we haven’t found any news sites catching on — just a couple Facebook event pages. We’d be concerned that it isn’t real as there wasn’t any mention on her normal social media channels, but we found that the concert is listed on the The theater’s official events page. We don’t need any more confirmation than that. The politically-active artist is making her long-awaited return to the San Francisco Bay Area and her fans can’t be more excited. M.I.A. hasn’t put on a concert where she was the headliner in some time, spending the majority of the last year running around performing at festivals such as the Riot Fest in Chicago and The Meadows Music and Arts Festival in New York City. With the news that M.I.A. is playing Oakland — fans can’t help but wonder if a larger tour isn’t far behind. The hopes is that she’ll announce tour dates to support her A.I.M. album that came out more than a year ago. 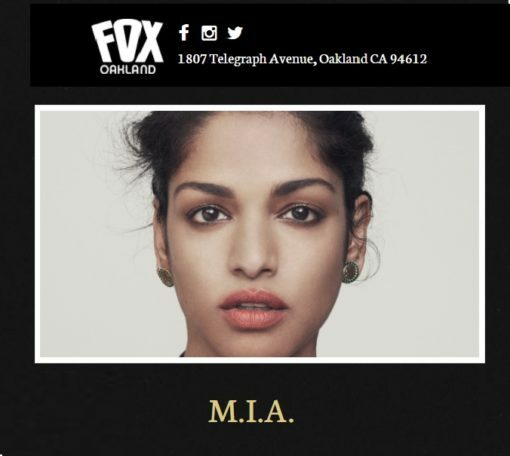 The Fox Oakland is located at 1807 Telegraph Avenue, Oakland CA 94612. If you’re interested in buying tickets, they go on sale to the public on September 8th. Go to The Fox Theater’s official website to purchase tickets for GA Floor or Balcony Seats, both for around $40. To avoid service charges, you can go to The Fox Theater’s Box Office (located on the 19th street side of the theater) on show dates and on Fridays from 12 PM to 7 PM.